A Sydney judge has sentenced a driver who crashed while under the influence of drugs in 2015, killing three of his friends, to a maximum 6 and 1/2 years in jail. Ben Sawyer, 19 and Luke Shanahan, 21, and a third male teenager, aged 17, all died when Jordan Brown, a P-plate driver at the time, crossed onto the wrong side of the Bells Line of Road near Bilpin and crashed head-on with another car. Barbara McLaren, the driver of that vehicle, was left with serious injuries and Daniel Richards, a fourth passenger in Brown's car, also survived. 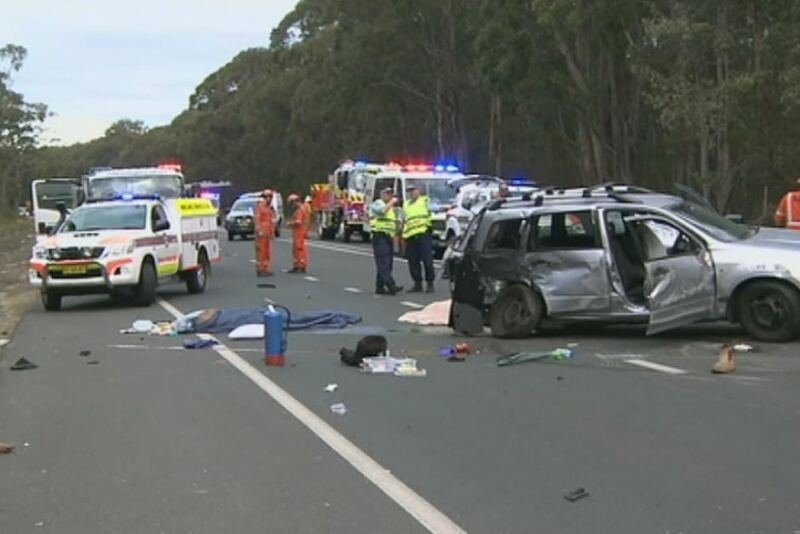 The group were driving back to Sydney's northern beaches after they had attended the Psyfari dance festival near Lithgow, when the drug-induced crash occurred. Brown, now 21, received a non-parole period of 4 and 1/2 years' jail, after he pleaded guilty to dangerous driving causing death and driving under the influence of drugs. "This is another case of a fine young man failing to act responsibly by consuming drugs at a dance festival and driving under their influence," District Court Judge Jeffery McLennan said. "The consequences of the offenders conduct have been immense. "It is not to be forgotten that two of his closet friends were killed in the accident as well as another young man he was friendly with." Previously Brown told the court he had taken one ecstasy capsule about 36 hours before the crash. "I didn't think the drugs would still be in my system," he said. But Judge McLennan today disputed that argument and referred to a toxicology report that had found a high level of drugs in Brown's system. "I am satisfied beyond a reasonable doubt that the evidence that is agreed fact, establishes... he had used MDMA in the early hours of the morning [of the crash]," the judge said. "He was under the influence of the active phase of the drug." At an earlier hearing Georgina Sawyer, the mother of one of the men killed, told a packed courtroom the grief she was suffering was insurmountable and she was completely broken. "I have so much hate, it scares me... I will never recover from this," she said. Ms Sawyer said she would never forgive the driver. "That kid [her son, Ben] never stood a chance. He was driven to his death," she said. "I'm not interested in the law or another adjournment. Please give him [Brown] a minimum of 10 years." The judge said Brown did not deserve the maximum penalty for his crimes — which could have been 10 years for the dangerous driving charge and seven years for the grievous bodily harm charge. But he said there is still a high degree of moral culpability associated with Brown's crimes. Judge McLennan said the offender was young, had no prior convictions, had shown genuine remorse, and was unlikely to offend. He discounted the sentence owing to the offender's guilty plea but highlighted the danger posed to the public by Brown's decision to drive. "This driving occurred on a major road" Judge McLennan said, noting that it put many road users at risk. Brown, dressed in a suit at the hearing, looked down and tried to avoid the gaze of people in the public gallery as his sentence was handed down.